Purpose: To discuss the advantages of pedicle buccal fat pad flaps used to cover areas of exposed bone of the lateral hard palate. Patients and Methods: Fifty patients had buccal fat pad flaps used in cleft palate repair. Fat pad is filled into the lateral defect and sutured to palatal flap and gingiva without any tension over the midline suture of palatal flap. 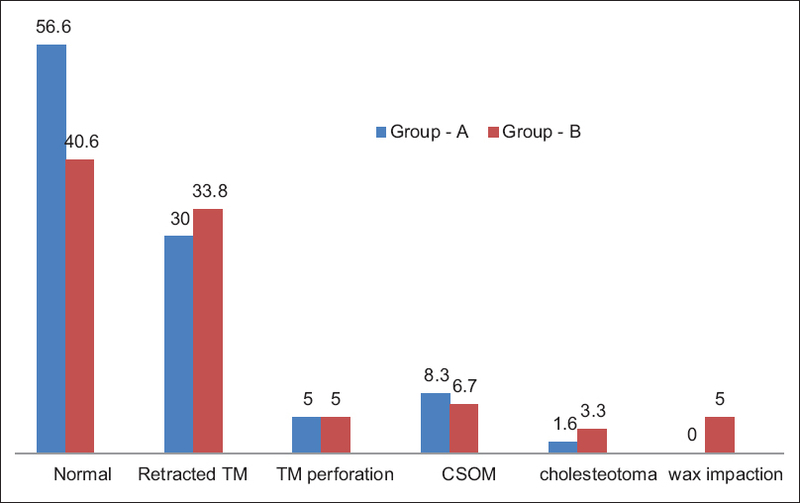 Results: No patients had any perioperative complication related to buccal fat pad or donor-site. In all cleft palate patients, the recipient areas fully epithelialized within 2 weeks or less. No patients had developed infection, loss of graft, palatal fistulas, or cheek depression. 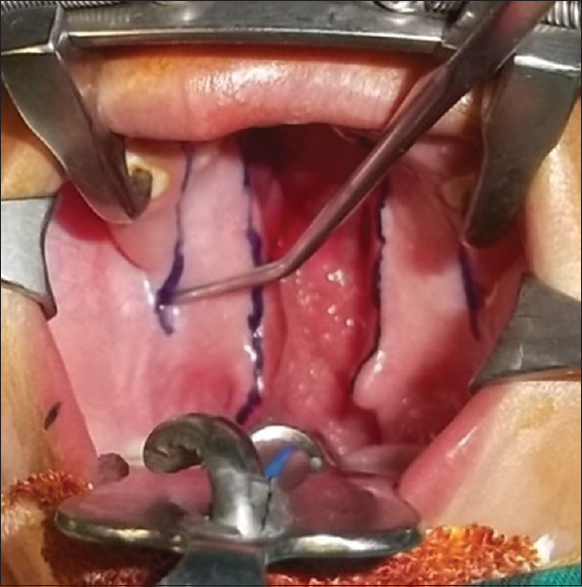 Conclusion: This technique allows safe, simple, durable, autologous, and vascularized coverage of the denuded bony hard palate. Context: Hypernasality is a frequently encountered problem in the speech of individuals with cleft palate with/without cleft lip (CP ± L). Aims: The aim of the present study was to explore the relation between perceptual and instrumental analysis of hypernasality in children with repaired CP ± L. Settings and Design: Comparative. Subjects and Methods: Children were divided into two groups. Group I included of 30 children operated for CP ± L and Group II included children in the age group of 4 -11 years in the age range of 4-11 years were included in the study. Specially constructed oral sentences in Marathi were used for the perceptual and instrumental analysis of speech. In addition, a number counting task and picture description was recorded for perceptual assessment. Nasal view Dr. Speech "Version 4 was used for instrumental assessment. Perceptual assessment for hypernasality was carried out by listening to the prerecorded speech samples by two experienced speech language pathologists. Statistical Analysis Used: Kappa coefficient, Pearson's product moment correlation. Results: The results of the study indicated a strong relationship between perceptual rating of nasality and nasalance scores for oral sentences. Conclusions: Nasal view was able to distinguish between normal resonance and hypernasality in speech of children with CP ± L.
Objective: To compare the oral and dental health in patients with or without cleft lip and palate (CLP) deformities, undergoing orthodontic treatment. Materials and Methods: The study group comprised fifty patients with CLP. 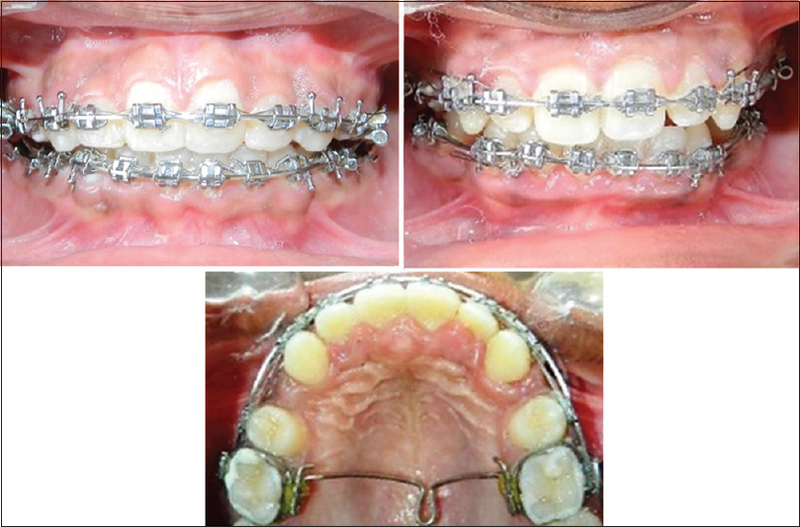 These patients were compared with fifty matched patients (control group) who had no CLP and had undergone orthodontic treatment for other indications at the same institute. Oral hygiene was evaluated clinically according to the simplified oral hygiene index (OHI). Dental caries examination was done according to decayed, missing, and filled teeth (DMFT) index. The scores were compared between the two groups. Results: The mean OHI score in cleft patients was 4.5 and in noncleft patients was 3.9 (P < 0.001).The mean DMFT score was 0.980 in cleft patients and 0.380 in noncleft patients (P < 0.001). Conclusion: This study clearly found that oral and dental health is compromised in CLP patients undergoing orthodontic treatment compared to patients undergoing routine orthodontic treatment. This article also proves that CLP is more predominant in males than in females. Objective: To evaluate relative maxillary arch constriction in patients with unilateral cleft lip and palate (UCLP) and isolated cleft palate (CP) during growth and the reproducibility of a commercial three-dimensional (3D) small object scanner. Design and Setting: Retrospective longitudinal study, University Dental Hospital. Materials and Methods: Plaster models at age 5, 10, and 15 years of ten patients with UCLP and CP were scanned using a commercial 3D small object scanner (http://www.NextEngine.com). Three observers scored the plaster and digital models using the 5-year-old/GOSLON and modified Huddart/Bodenham (MHB) indices and again 3 weeks later. Two-way ANOVA (P < 0.05) calculated the significance of the differences between age and group (UCLP and CP). Weighted Kappa and Kendall's coefficient values determined agreement within and between the observers. Results: There were no statistically significant changes in the occlusal index scores with age (P > 0.05). For plaster models, intra- and inter-observer reproducibility were good to very good (0.74-0.84 and 0.84-0.86) using 5-year-old/GOSLON indices compared with good to very good (0.72-0.85) and very good (0.84-0.86) for the MHB index. For digital models, there was moderate to good intra- (0.46-0.79) and inter-observer (0.44-0.67) reproducibility for the 5-year-old/GOSLON indices compared with good intra- (0.66-0.75) and interobserver reproducibility (0.68-0.71) with the MHB index. Conclusions: There was no progressive worsening of relative maxillary arch constriction with growth in UCLP and CP. The reproducibility of the 5-year-old/GOSLON and MHB indices was acceptable with digital models produced using the commercial 3D small object scanner but good to very good for plaster models. 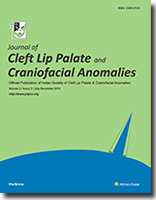 Longitudinal evaluation of maxillary growth in patients with repaired orofacial clefts using these methods is both informative for the care of the individual patient and an important step in refining surgical protocols in countries such as India. Context: The type of suture material used in surgery has been a long standing debate among surgeons. In this study we compared rapidly absorbable suture material (Vicryl Rapide TM or Irradiated Polygalactin 910) with non-absorbable suture material (Nylon or Polyamide) in patients with nonsyndromic congenital unilateral cleft lip. Aims: To compare the appearance and course of scar, wound infection and patient's parent perception between the two groups. Settings and Design: Randomized prospective controlled study. Methods and Material: 20 patients, in the age group of 3-18 months were randomly allocated to two groups with 10 patients each. Skin suturing was done with 6-0 Polyamide and 6-0 Irradiated polygalactin the respective groups. Patients were evaluated at 1 week, 1 month, 3 months, 6 months and 1 year postoperatively by the observer as well as by the patient's parent. Results and Conclusion: It was found that Vicryl Rapide showed poorer cosmetic outcomes regarding height and pigmentation of scar as compared to nylon sutures.However, this sample size and follow-up period is very small to generalize these findings. Introduction: Three-dimensional (3D) printing (additive manufacturing, rapid prototyping) is a technology that has attracted the attention of craniofacial surgeons to gain perfection in analysis, planning and execution of complex surgical challenges. Rapid prototyping technology was introduced to surgery via computer-aided design/computer-aided manufacturing, which enabled two-dimensional planning. The purpose of this article is to demonstrate the application of 3D printing (3DP) technology in craniofacial surgery, with a specific intention of addressing the planning of complex 3D deformities. 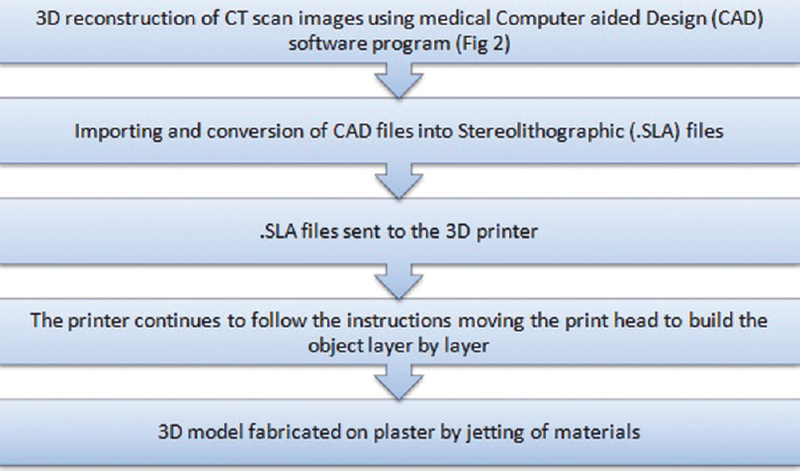 Materials and Methods: This was a retrospective analysis of our surgical cases where we have used 3DP technology in 10 cases from 2014 to 2016 at a tertiary care hospital in India. 3D models were used in planning the correction of hypertelorism, craniosynostosis - open and endoscopic techniques, hemifacial microsomia, skull bone defects, and secondary orbital floor defects. The process of preparing a 3DP implant from a locally based company to suit the economic constraints of the patient has also been addressed in this article. Results: Each of the 10 patients are discussed, where this technology was used for planning, execution and training in craniofacial surgery. With the experience gained through these cases, the authors discuss the advantages of using 3DP technology in assessment of the true defect, accurate planning of the procedure, performance of model surgery, patient education, resident training, preparation of custom made implants, and more importantly providing all of these in an economical price using a locally based company for production of 3D models. Conclusion: 3DP models will revolutionize the way plastic and craniofacial surgeons think and plan surgical simulation. The authors recommend a wider application of such a technology to orthognathic surgery and any surgery that requires bony osteotomies with movement. Introduction: In an infant, cleft palate usually affects his/her feeding, speech, eustachian tube, and middle ear physiology. The incidence of otitis media with effusion is particularly very high in the children having cleft palate. 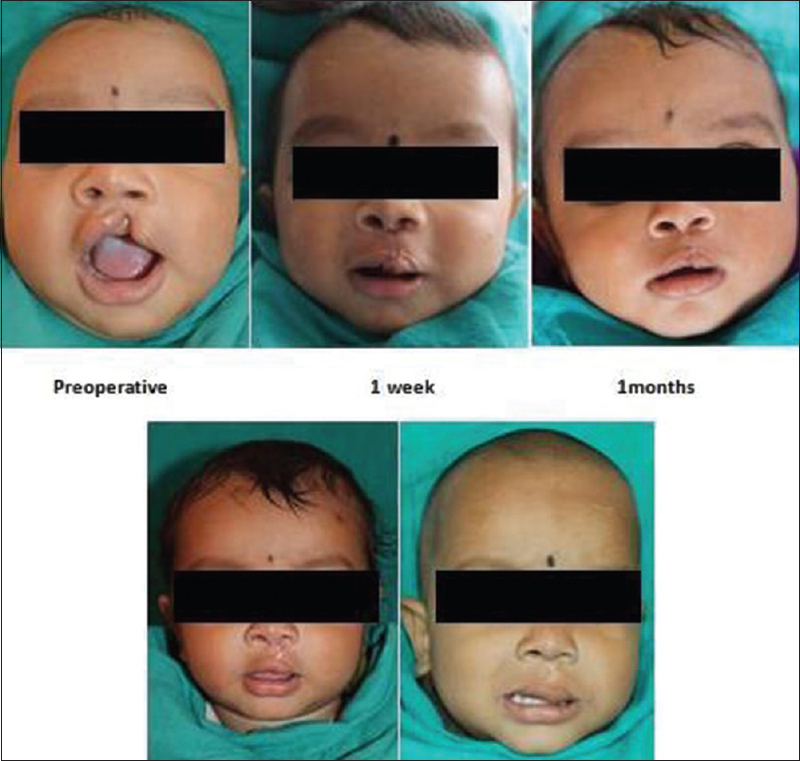 Repair of cleft palate is believed to reduce this incidence. Objective: This study was conducted to assess the effect of cleft palate repair on middle ear physiology. Methodology: The study sample was divided into two groups: Group A consists of patients who are 6 years and older with unrepaired cleft palate and Group B of the patients whose cleft palate were repaired before the age of 2 years and completed at least 4 years after surgery. There were thirty patients in each group. All of them were evaluated clinically, by otoscopy and tympanometry. Clinical assessment included examination of the palate in terms of the presence of scarring, fistula, length of soft palate (visual assessment only), mobility of the soft palate, and speech scoring by Pittsburgh weighted speech score. Results: About 21% of operated patients had velopharyngeal incompetence. Thirty-four ears (56.6%) in Group A and 24 ears (40.6%) in Group B had normal otoscopy finding. Normal tympanogram (Type A curve) was found in exactly similar proportion of ears examined in both the groups (20% each). Conclusion: Early repair of cleft palate did not have any beneficial effect on middle ear pathology. The incidence of rare craniofacial clefts ranges from 1.43 to 4.85/100,000 live births. Most craniofacial centers report an incidence of 9.4-34 cases of rare clefts for every 1000 clefts. Among these Tessier clefts, the number 2 cleft is the rarest. 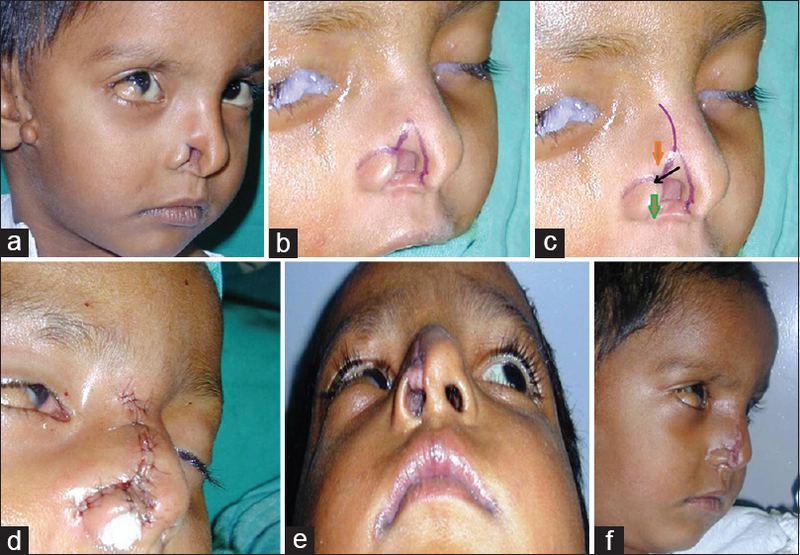 We report one such case of complete number 2 nasal cleft in a 3-year-old boy, with features of Goldenhar syndrome, such as preauricular tags, epibulbar dermoid, and coloboma of middle one-third of the upper eyelid. This combination is extremely rare and has only been reported once before in literature. Reconstruction of the nasal cleft was carried out using a modification of Denonvilliers Z-plasty along with a composite graft from the right helix and rotation of dorsal nasal skin. Rare facial cleft combinations reinforce the embryological basis that they are likely to result from the disruption in migration of neural crest cells from rhombomeres to branchial arches by genetic manipulation by teratogens, rather than other simplistic theories. Facial clefts are extremely rare congenital deformities, especially Type 3. In 1976, Tessier classified the clefts between 0 and 14 based on the central facial landmarks. 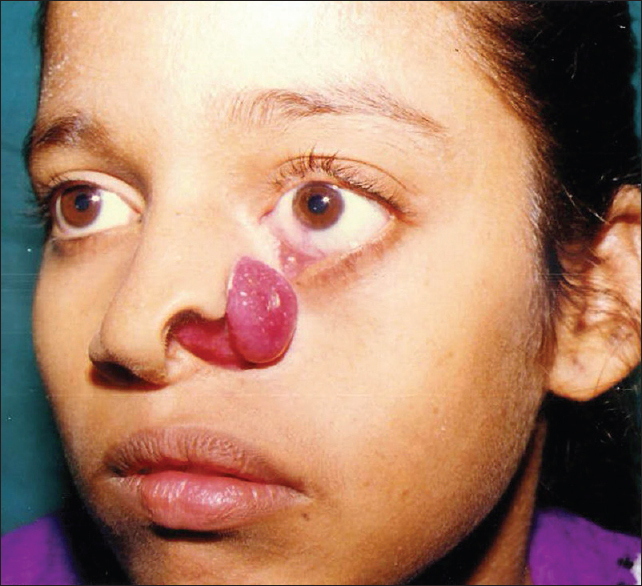 The Tessier type 3 facial cleft, also called a nasoocular or a nasomaxillary cleft, results from the disruption of the lateral nasal and maxillary processes. It is characterized by inferior displacement of the medial canthus, superior displacement of the alar base, cleft lip and palate, coloboma of lower eyelids, nasolacrimal abnormalities, cleft of the inferomedial orbital wall, and teleorbitism. Although the literature is replete with classification and morbid anatomy of such cases, surgical management is still a challenge. In this article, we report a Tessier No. 3 incomplete cleft, wherein the turbinate mucosal flap was used for the nasal lining in reconstruction of the nose. Probably, this is the first time that the turbinate mucosal flap is used for reconstruction in Tessier No. 3 cleft.